Mega Earthquakes have destroyed California! It’s up to you to rebuild and connect the now disjointed islands. But can you survive the incoming aftershocks? WOW! Talk about a brand new Hotness! 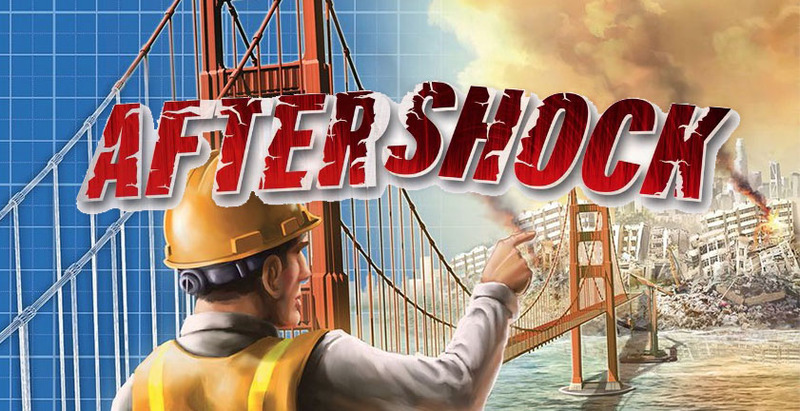 Aftershock is a competitive area control game with hand management mechanics and a close economic system. 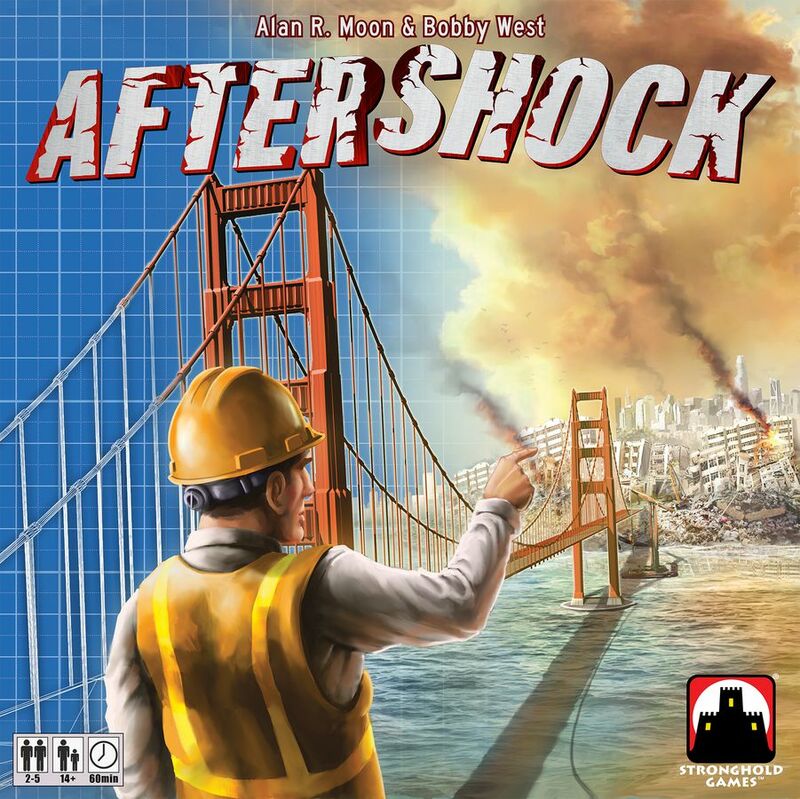 The players are each attempting to rebuild the San Francisco bay area after Mega Earthquakes have completely devastated the area. The player who scores the most points after a set number of rounds wins! Each round plays out over 4 phases. The first phase has players buying cards, which will give them the resource they will use throughout the remainder of the turn. 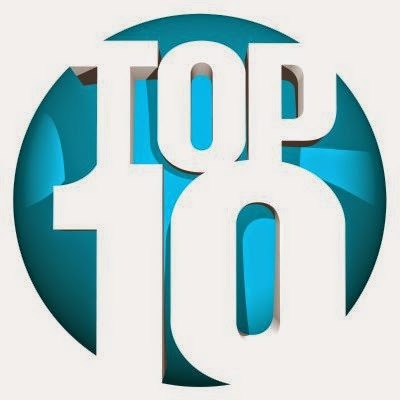 Each player begins with8 cards and $15M and will use that to buy cards which will grant them workers to place in certain cities, bridges to connect those cities and Influence which will assist in the scoring phase later. 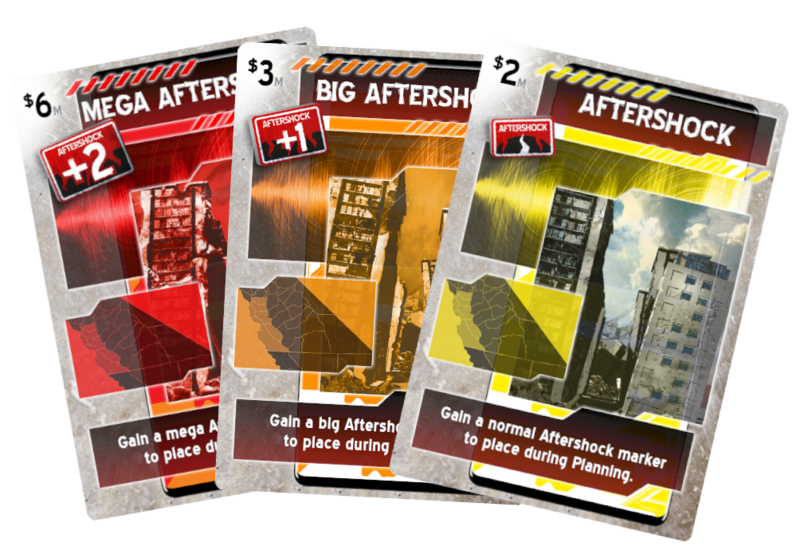 Additionally, players can buy Aftershock cards. These cards will allow that player to force an aftershock to occur in later phases. These aftershocks will move workers around the board right before scoring, which can be helpful or not. Each player uses their $15M to buy as many of their 8 cards as they wish. Afterwards, the remaining cards become available to other players to buy. Players take turns buying cards from one another in a closed economic system. This means money will exchange hands and there will only ever be as much money as when the game started. Once all the cards are purchased, the second phase has each player will reveal the city cards they purchased, then place their workers on those cities. Then, players will collect all of the tokens owed to them by the others cards they purchased and secretly place them on their player mat, hidden behind a screen. 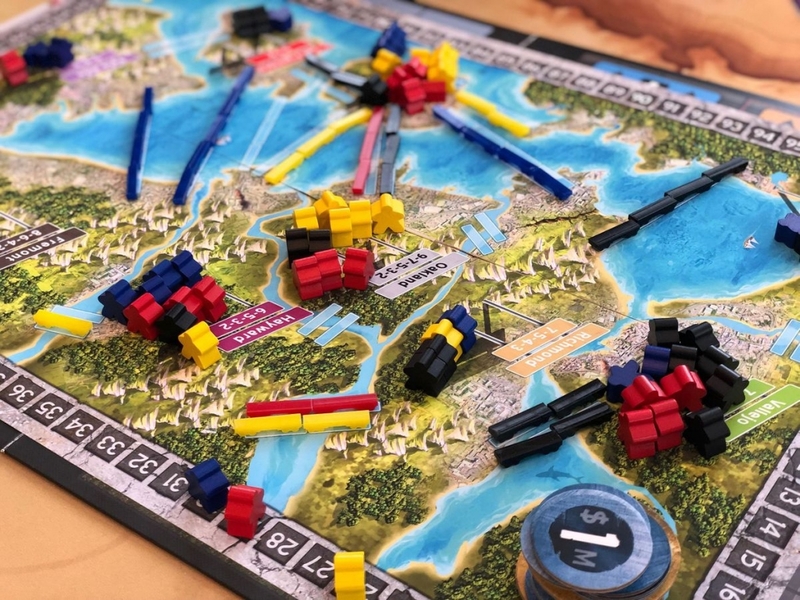 In the third phase of the round, each player reveals their player board and places their workers and bridges on the cities noted on the board. This is also when players will cause their aftershocks. Any aftershock tokens revealed during this phase will cause an aftershock in that area. The player rolls a die and adds the number on the aftershock token. They then pick that number of workers in that area, and those workers must leave that area. These workers can travel as far as they’d like so long as there are bridges to travel across. Traveling across your own bridge is free, but a toll must be paid to cross an opponent’s bridge. Now that aftershocks have totally disrupted every player’s carefully placed workers, the fourth phase is scoring. 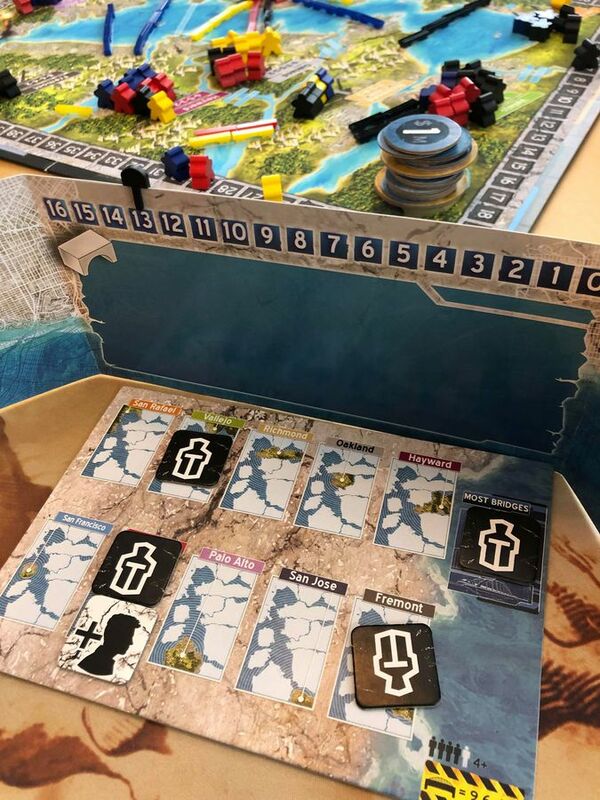 Players hide their player boards again and place their 3 scoring tokens on 3 separate cities or the bridge place on their board. Players can also place their Influence token on one of those cities as well. All players reveal their boards and any city with at least 2 scoring tokens collectively on it, among all player boards will be scored. Since a player can only place 1 scoring token on each city, an Influence token allows that player to force an area to be scored. 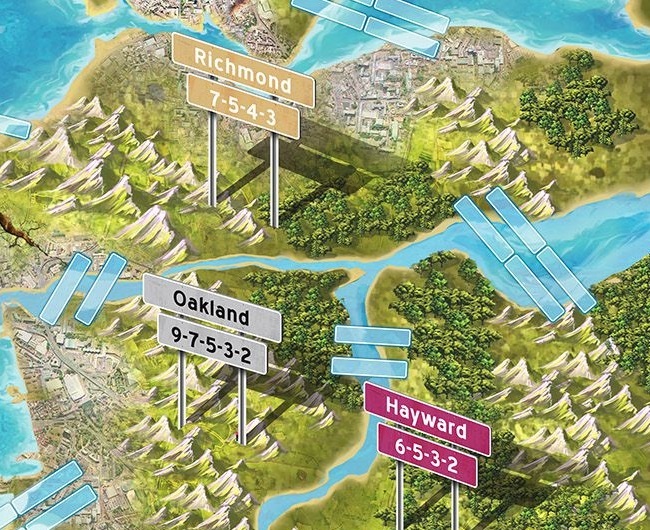 Players gain points based on how many workers they have in that city when it is scored. After 3 rounds, the game ends and whichever player has the most points wins the game!